Marble Wastewater Treatment Plant is a compact system designed by CFP. All of the system runs automatically without labor force. CFP manufactures special designed application of Filter Press in the Wastewater Treatment for Marble & Stone industries. Up to 60 m3/hour can be recycled by the single silo stream. Marble wastewater recycling plant consists of silo sedimentation tank, silo treated water storage tank, filter press, polymer preperation systems and sludge conditioning tank with mixer. Wastewater originating from marble or granite cutting process, comes into the first concrete balance tank. In this underground balance tank wastewater is collected before the lifting to the treatment plant. Second, by the help of submersible water pumps, wastewater is lifted the top of silo type sedimentation tank. 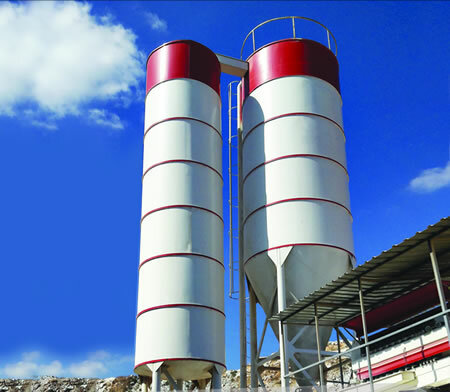 Silo type sedimentation tank include cylindrical and conical parts. Also it has V slot type flumes and inner cylindrical hole to prevent floctuation of treated water level. Thanks to inner cylindrical hole suspended solid part of the sludge goes directly the conical part of the sedimentation tank. Clear supernatant treated water goes up to the sedimentation tank and enters the V slot type flumes. Treated supernatant part of the water colleted to silo type treated water tank to further use from the marble cutting process. Third, in the bottom part of the sedimentation tank (conical part) connected to sludge thickening tank with an automated pnömatik valve. Signal from the electrical panel arrange the time of the opening and taking the sludge into sludge thickening tank. After sludge comes into thickening tank, automatic polymer preparation system doses the tank with polyelectrolyte polimer. Fourth, conditioned sludge with polymer is pumped to the automatic filter press by the high pressure sludge pumps. Finally, after filter press full of dryed sludge, filter press is opened automatically and drops the sludge cakes into the container. And again starts the filtration process after the closing of the filter press. You can download marble filter press catalog from this link.